Next time you have a craving for peanut butter cookies, try these old-fashioned 3 ingredient peanut butter cookies! You won’t believe how easy (and totally delicious) they are! Hi friends! 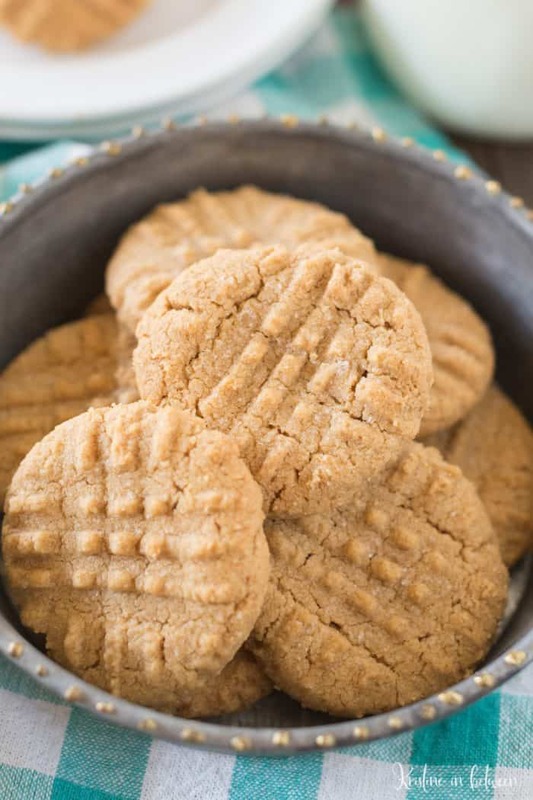 It’s Kristine from Kristine in between again, popping over to share my favorite old-fashioned peanut butter cookie recipe with you today. Let me tell ya, they are cookie perfection! 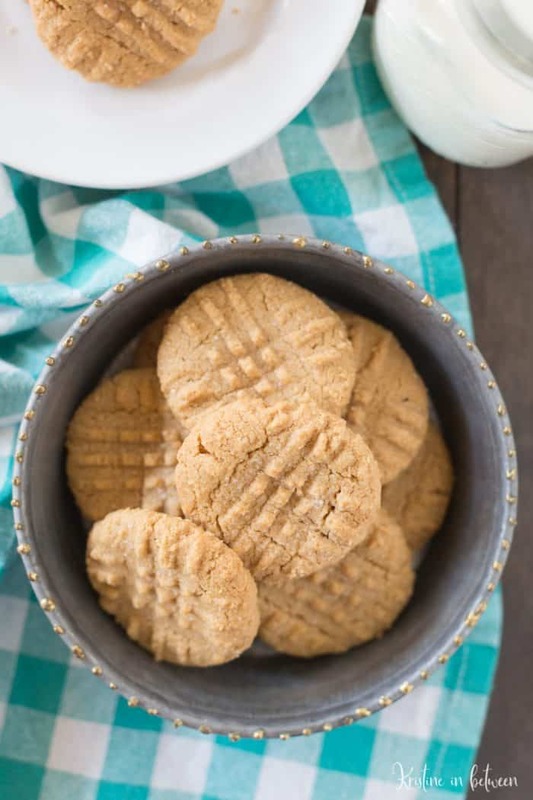 And you’ll never believe it, but these little peanut butter cookies only have 3 simple ingredients! I know – SO AWESOME! As I’m sure you’re learning, I have a cookie problem. I do. And because of that, there is a lot of cookie bakin’ going on at my house. All. The. Time. Almost every day I’m working on something new! But when it comes to baking a cookie treat for my family, I almost always resort to an old trusty recipe. 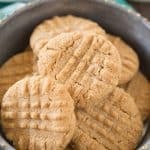 These 3 ingredient peanut butter cookies are just that, old and trusted, as well as simple, soft, crumbly, and completely delicious! Second to the taste and texture of these cookies, my favorite part is that the ingredients are in my pantry 100% of the time, so I can whip up a batch whenever the need (or want) arises! Oh, and they’re perfect for getting the little ones involved without making a humongous mess (one bowl and a few cookie sheets should do the trick). You’re welcome! Egg. Sugar. Peanut butter. That’s all you need to have a soft, crumbly, bursting with peanut butter flavor (and did I mention, gluten-free?) batch of cookies! I know, I almost can’t believe it myself! 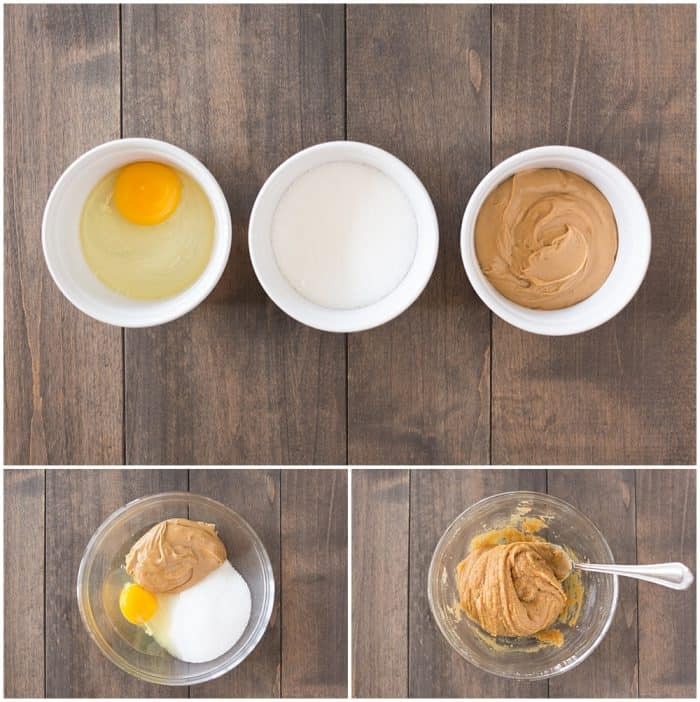 The process is simple; in a medium bowl you combine the 3 ingredients and mix until smooth. Then you just scoop them out by the tablespoon, gently flatten them with a fork, sprinkle with sugar (which is optional, but I mean why wouldn’t you???) and throw them in the oven (not literally, of course – please don’t throw the cookies; that will most certainly end up being a big mess and no-one wants that!). And then, after a few minutes at 350 degrees, when you open the oven, you’ll find these perfectly sweet old-fashioned 3 ingredient peanut butter cookies! There are a few things you should know about these cookies though, so check out these tips. These cookies are super soft and crumbly right out of the oven. Please don’t try to eat them right away! They need a few (or more like 10 to 15) minutes on the pan before being moved. Trust me, they’re worth the wait! Yes, you can add 1 tsp of vanilla extract and/or 1/4 tsp salt to the recipe to enhance/balance the flavors, but that makes them more like 4 or 5 ingredient cookies, haha! You can also add an extra egg to make them a little chewier if you don’t prefer a crumbly cookie. A quick and easy old-fashioned crumbly peanut butter cookie made with only three simple ingredients. They’re perfect every time! In a medium bowl, combine ingredients and stir until smooth. Scoop dough by the tablespoon onto cookie sheets 2 inches apart. 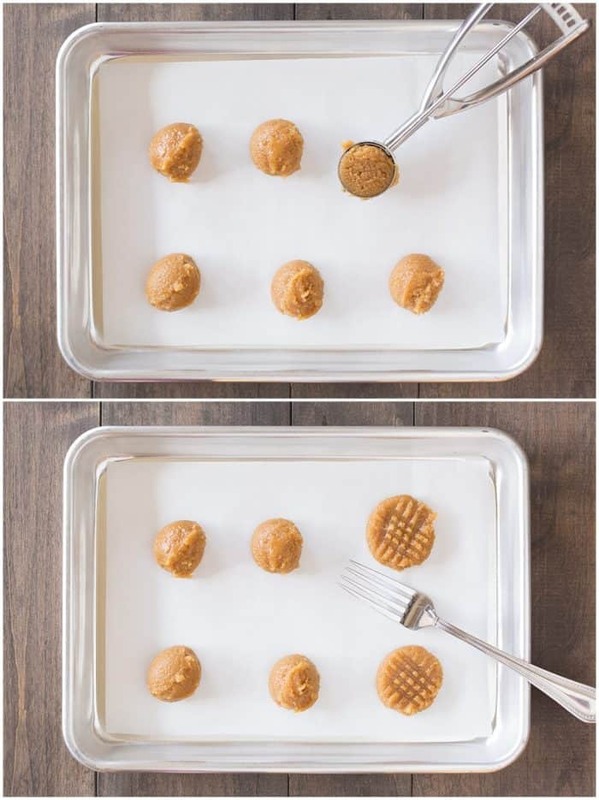 Using the backs of a fork gently press down on the top of each cookie crossways. Sprinkle the tops of each cookie with sugar (if you're doing this). Bake for 12 minutes, rotating halfway through. Let cookies cool on the pan for 10-15 minutes prior to transferring to a wire rack. Store in an airtight container or freeze. Now is the perfect time, grab the kids and a bowl and get baking! And if you’re a real peanut butter lover you’ll definitely want to check out my flourless peanut butter cookies, my homemade peanut butter chocolate crunch bars, or my no-bake chocolate peanut butter bars! So. Much. Peanut Butter. Goodness. My kids love peanut butter cookies so I often make them some. Always a winning cookie with my kids. This looks perfect. You can’t go wrong with anything peanut butter and I love how simple these cookies are. Oh man, I totally agree Danielle! These are the best! These peanut butter cookies look absolutely perfect. Loving that bowl too! Beautiful photos. Thank you so much Regina! These are one of my favorites! YUM! I love peanut butter cookies and these so easy cookies look simply perfect and delicious! I have to try them soon as it really is so simple to make!